These species have strong cultural links with the peoples of the Pacific and feature in many of our myths, legends, songs and traditions. Traditionally, marine turtles were considered a sacred food item reserved only for those of noble birth. Over time, marine turtles have been subjected to a heightened level of threat as customary practices eroded and their popularity in commercial markets increased. 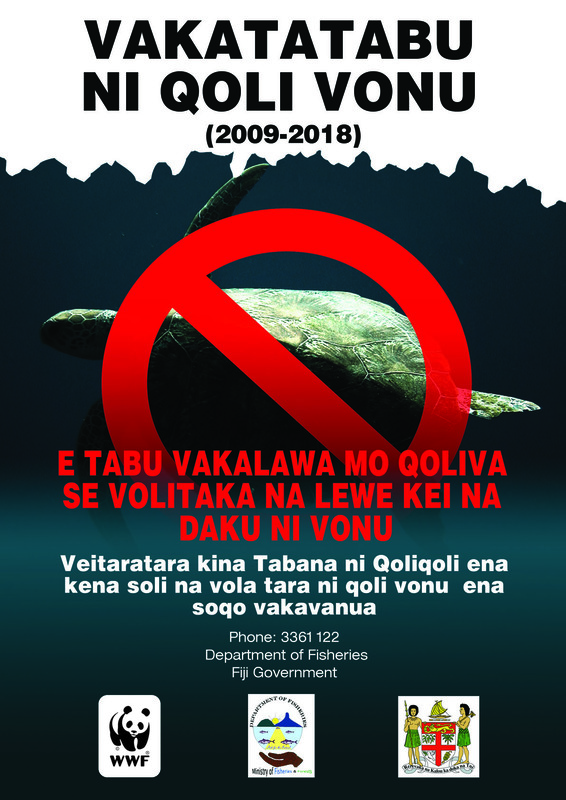 WWF South Pacific recognises that marine turtles are a sensitive issue due to their being intricately linked with culture and people's subsistence needs. WWF South Pacific, therefore, employs four key strategies to engage with people at various levels in order to recover sea turtle populations in the Pacific Islands region: the Dau ni Vonu network, awareness, research, and advocacy. 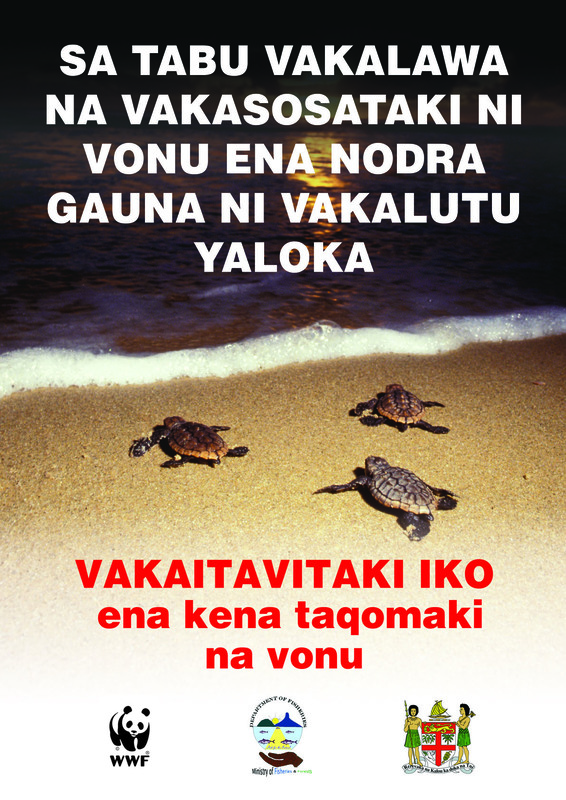 Download and print your own WWF turtle conservation posters in both English and Fijian! A hatching green turtle. Turtle eggs have long been considered a delicacy in Fiji, reserved for special occasions such as birthdays. 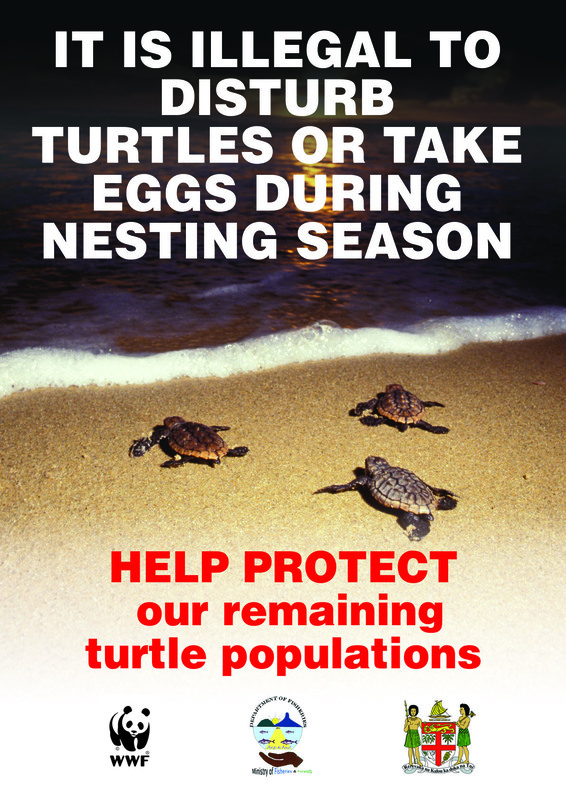 However, as numbers decline practice such as this have become a serious threat to turtle populations. The Dau ni Vonu, or Turtle Monitors, are members of 10 local community field sites where turtles are under threat, often remote islands. It was not so long ago in Fiji that eating turtle meat was commonplace; many people grew up on turtle meat. 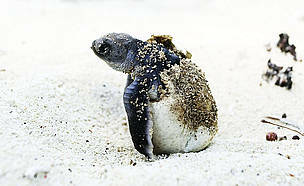 Today WWF's efforts and the Turtle Moratorium banning the harvesting of turtles is beginning to change this. And an important way of changing behaviour, especially on remote islands, is through the Dau ni Vonu. Often former turtle-hunters themselves, the Dau ni Vonu are the best there are at finding feeding adults, nesters and eggs. The Dau ni Vonu are trained not only to record sightings, nesters and numbers of eggs, but to monitor seagrass health (their food) and even to affix satellite tags to captured turtles' carapaces (shells) in order to track individuals as they journey around the Pacific. By allowing conservationist to record turtles' critical habitats and nesting beaches, satellite tagging is a vital tool in guiding future conservation efforts. Knowledge gaps are a constraint on making good decisions. WWF South Pacific collaborates with partners to systematically monitor and collate information through biological and socio-economic surveys of identified sites. 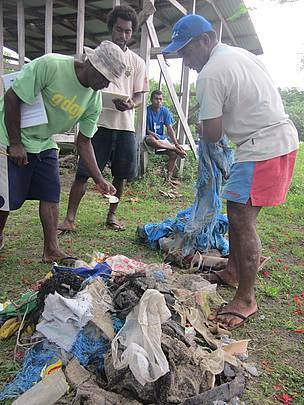 Information gathered through implementing activities such as nesting beach surveys, satellite tracking of turtles, and market assessments is used by WWF South Pacific to support behavioural and policy changes. Marine turtles are only dependent on the beach for egg incubation and spend most of their lifetime in coastal waters, feeding in coral reefs. Satellite tagging individuals is crucial for better understanding their post-nesting movement and habitat use. How are satellite transmitters deployed on sea turtles? The KIWISAT 101 (a model of satellite transmitters designed for marine tracking) is hydrodynamically shaped and weighs a minute 630g. It is attached to the turtle's carapace (shell) with dental putty (the stuff used to make dental impressions) as a base and encased using epoxy adhesive. The whole process (including the preparation of the carapace and taking necessary measurements) can be completed within 3 hours in which the turtle will be safely released after. The attachment is intended to be an impermanent fixture as it is meant to be easily removed if encountered after the usefulness of the device has expired or eventually detach itself due to prolong deterioration of the adhesive. 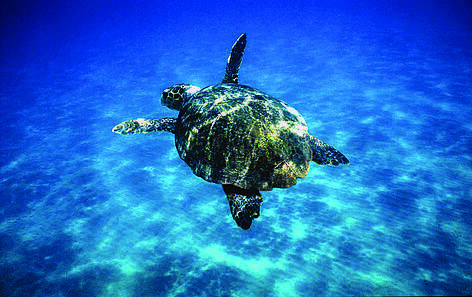 In recognising the need to create conditions that will allow these slow maturing animals to breed and feed successfully, WWF South Pacific supports partners like the Department of Fisheries in the development and implementation of policies such as the Fiji Sea Turtle Recovery Plan and the Moratorium that are geared towards protecting turtles while in Fiji waters. WWF South Pacific also engages at the regional and international level in the development of policies and actions relevant to national priorities. WWF South Pacific believes that the conservation of marine turtles and their key habitats will also address broader environmental challenges such as coastal erosion, marine pollution and coral reef degradation. WWF South Pacific places great emphasis in engaging local communities to recognise their invaluable traditional and local knowledge which complements Western science. WWF successfully advocated for a 10 year extension of the moratorium criminalising the harvesting of turtle and their derivatives. 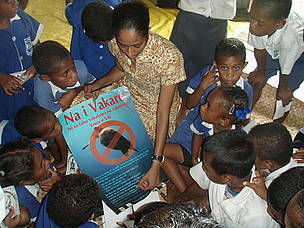 WWF South Pacific has run successful awareness raising campaigns for turtles through activities such as the annual turtle roadshow - an initiative that targets school children of primary and secondary levels. These roadshows have been conducted across areas where WWF works to implement it's ecosystem based management work (Great Sea Reef, Macuata) as well as areas that from records are shown to be high harvest areas. An exciting and fun activity that serves to raise awareness and funds simultaneously is the annual black tie Turtle Ball - a social event that is hosted by WWF South Pacific to engage with members of Fiji's urban and corporate community who significantly influence occurrences in the rural and coastal communities that have direct access to turtles.